Grits are a favorite at our house. It doesn’t matter the time of day – breakfast, lunch, or dinner. I can always satisfy my crew with some creamy delicious grits. 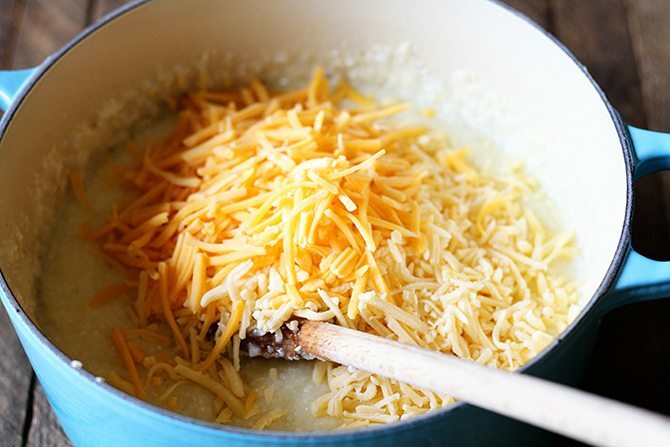 Cold mornings have always been met with a bowl of steaming cheese grits. And Shrimp and Grits is one of our dinner favorites. 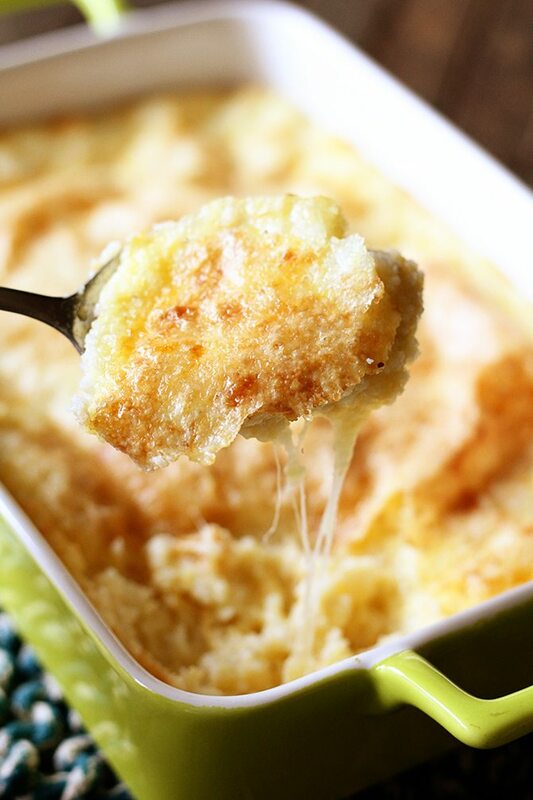 These Baked Garlic Cheese Grits are a favorite too. They’re perfect for brunch and make an amazing side to dinner as well. Baking them with cheese and garlic gives them a richer, heartier flavor that takes them to the next level. We’ve fallen into the tradition of making my Sticky Pecan Cinnamon Buns every Christmas morning because they’re easy for a busy morning, and are just decadent enough to be a real treat. 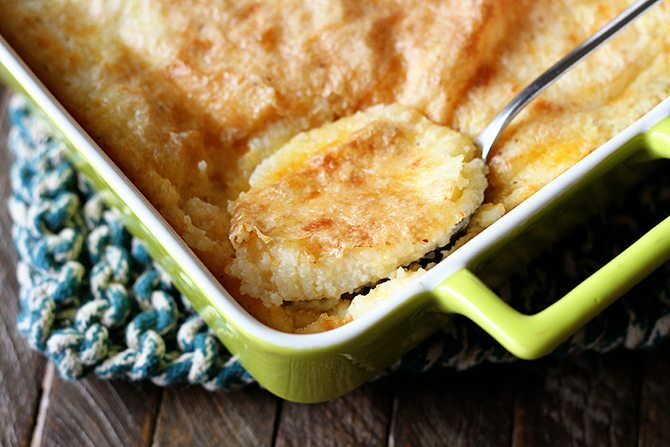 These Baked Grits are the perfect complement to them because they’re super savory and filled with creamy deliciousness. They’re also pretty easy, which is great for the amazing chaos of Christmas morning. The combination of the Borden® shredded Gouda and Sharp Cheddar is perfection. And I love the convenience of being able to get Gouda already shredded. It’s a real time saver. 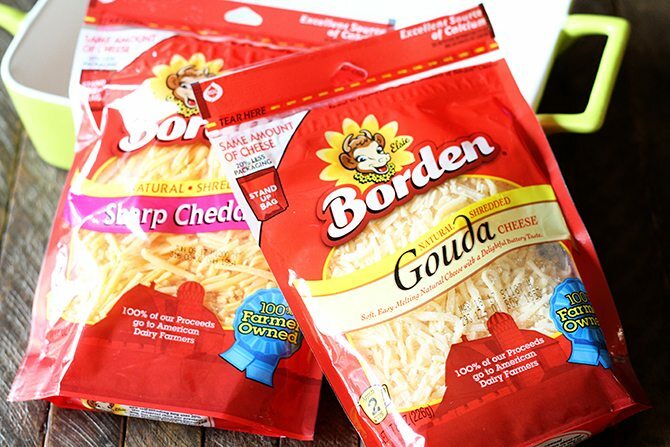 Borden Cheese has a wide range of offerings to satisfy every taste, including Mild Cheddar, Mozzarella, Mexican, Swiss, Sharp Cheddar, American, Colby Jack and more, which are available as singles, shreds, chunks, slices, strings and snacks. They’re the perfect recipe helper. I absolutely can’t wait for y’all to try these. 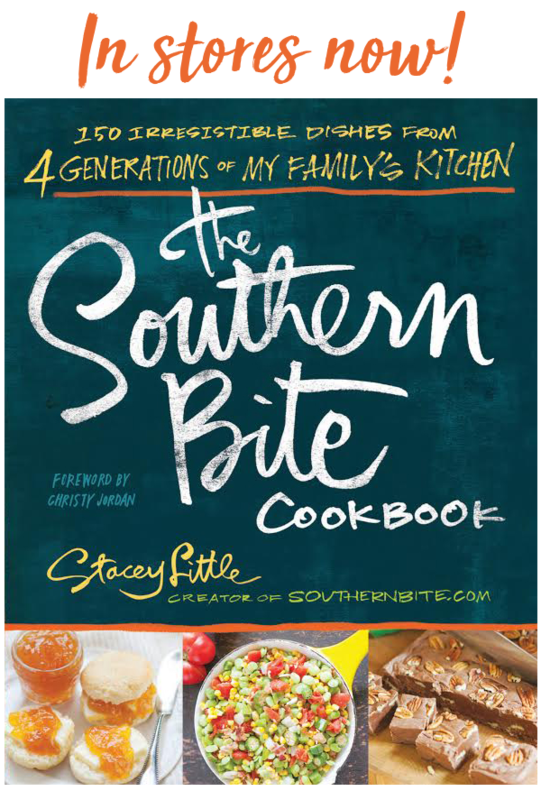 Whether it’s Christmas morning or any morning – or even brunch, lunch, or dinner – if you’re a grits lover, this just takes them to a whole new level that I think you’re going to really enjoy. Preheat the oven to 350°F and spray a 2-quart baking dish with nonstick cooking spray. Pour the water and salt into a medium pot and heat until boiling. Whisk in the grits, stirring briskly to keep them from clumping. Reduce the heat to a simmer and cook, stirring frequently, for about 10 minutes or until the grits are tender and thick. Stir in the butter and garlic powder. In a small bowl, whisk the milk and egg together. 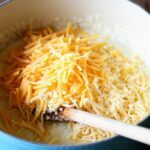 Stir it into the grits along with the cheeses. 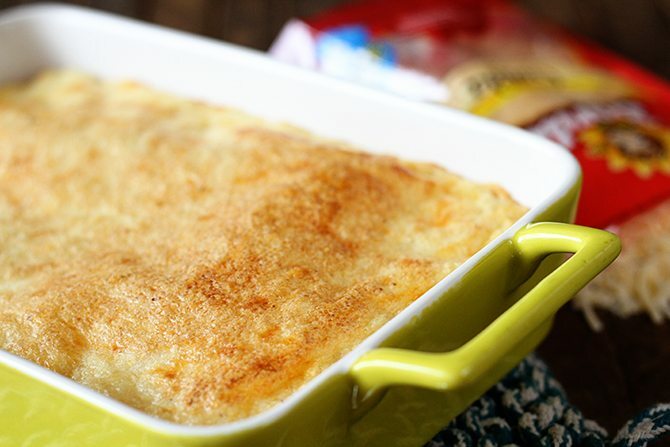 Pour the grits into the prepared baking dish and bake for 35 to 40 minutes or until set. This post is sponsored by my friends at Borden. All the thoughts and opinions expressed are my own… just as always. ? Yum! I love grits in any form, but this whole garlic idea sounds delicious! We used to make grit casserole with the Kraft Garlic Cheese roll that you can’t find anymore. Yummy! I love the idea of the cheesy grits paired with the pecan cinnamon buns. Fry up some bacon to go with it and that sounds like a perfect Christmas breakfast! Can the grits and the rest of the ingredients be made the night before and then put in the oven to bake? Just want to say Merry Christmas to you and your family. I have tried several of your recipes and enjoyed them very much ! I have never tried grits before so I am curious about them. They sound like some kind of porridge to me. I am going to have to try them . Any tips on cooking them?? Merry Christmas! 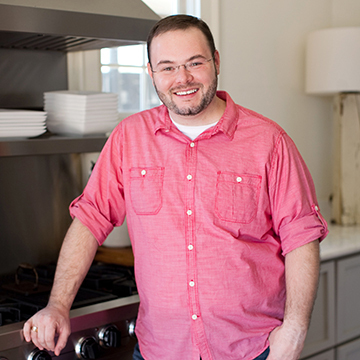 I’m so glad to hear you’ve enjoyed my recipes so far. Grits are one of my favorite things. They do have a texture that is similar to porridge. My biggest tip is once you stir in the grits reduce the heat to very low and cook them low and slow. Also, I find many folks under cook grits. Make sure they are tender. Enjoy! Hi Tracie! I’m actually quite well-versed in what the FTC says about sponsored content. That being said, I visited the link you sent (as I am already affiliated with Acorn) but saw no mention of disclosure placement. If you have some additional information, I’d love for you to shoot me an email so we can discuss. Thanks! Where can I find the Borden shredded Gouda Cheese ? I usually find it at my local grocery store, but you can buy a block of gouda and shred it too. I’ve not tried that, but it sure would be awesome if it works. If you try it, please let me know how it turns out!